Snack Girl's guest post today features La Jolla Mom. She has a great blog about kids, La Jolla (in California), and helpful tips for parents. Encouraging my 3 year old daughter to eat healthier foods became easier when I put more effort into making healthy food fun. This doesn’t have to mean expensive or fancy. 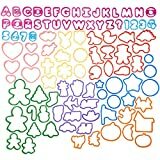 Below, I’ve included simple ideas should you need to prepare a healthy snack for the preschool set. Do your kids have a favorite show? Sometimes I can get La Jolla Girl to eat celery, because the Wonder Pets do. I once saw a vegetable platter in the shape of a cat and studied the reaction of the kids. They didn’t “see” the vegetables, they saw a cat. I then started staging vegetables with moderate success. I wish I could say it works all of the time, but some of the time is better than it used to be. The vegetable butterfly snacks above are easy to make and are inspired by something I saw on Nick Jr. The antennae are rosemary from my yard. Hummus is an easy, healthy dip for veggies that can be store bought or made quickly. I like Ina Garten’s Hummus recipe since it has no oil. For older preschoolers, anything on safe stick is more intriguing than a pile on a plate. I got the candy cane straws in the photo above at Party City for 25 cents each. My daughter named this strawberry and mozzarella combination “hearts and snowballs”. 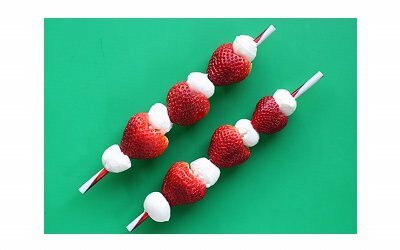 These snacks are festive and if you make them for a group, the kids can take the straws home with them. Or use cocktail sticks with balls on the end to spear fruit. It’s amazing how something so simple can put a smile on their faces. Make sure the kids pull the fruit off the sticks to eat it so they don’t hurt themselves. Changing the shape of a common food helps too. Calcium is critical to a child’s development. If you think your child isn’t getting enough, or maybe you just need to bring a festive snack to preschool, try this. 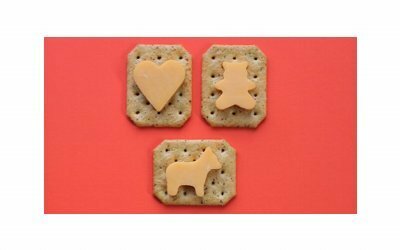 Cheese is very easy to cut with a small cookie cutter. You can use any waste in a grilled cheese sandwich later. Sandwiches can also be turned into something more kid friendly. 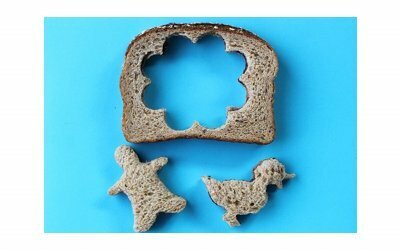 I brought peanut butter and jelly sandwiches shaped like ducks to preschool once, and it was the most popular snack I ever made. I use fruit spread from Trader Joe’s, which has less sugar than traditional jams or jellies. Sometimes I use Almond Butter instead of Peanut Butter, or I sneak bananas in the middle. The kids don’t complain. This strategy works with other sandwiches like turkey, cheese, and lettuce, though I find it tough with tomatoes inside. Not all of these healthy snack ideas will work 100% of the time, but it’s up to us, as parents, to do whatever we can to encourage healthy eating habits. How do you get your kids to eat healthy food? 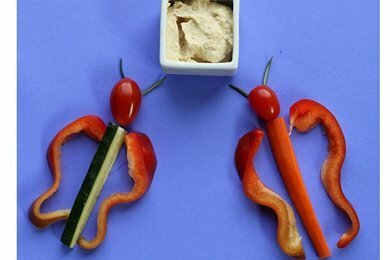 Lots of cute ideas for making lunches and snacks more appealing. If only there was more time in the day though!